I’ve always dreamed of visiting Africa and one main reason is its diverse habitats that are home to some of the most amazing animals. The closest I’ve come to Africa thus far is wandering the paths of Toronto Zoo’s Africa exhibits, from the depths of the African Rainforest Pavilion to the wide expanse of Kesho Park. In what appears to be the abyss of the African Rainforest Pavilion you find, within the darkness, Egyptian fruit bats, various arachnids almost camouflaged in their enclosures within the walls and always a favourite of mine – naked mole rats. These fascinating animals are one of only two known mammals that are eusocial like ants and bees; meaning there is one breeding female (queen), a few breeding males and the rest of the colony acts as workers. Extensive tunnels make up their habitat, with chambers for feeding, sleeping and a lavatory. If these partially blind, hairless, sausage-like pink rodents aren’t scurrying around their tunnels, with more dominant individuals crawling over top of others, then they’re piled high and packed into sleeping chambers. Taking the scenic route around the African Rainforest Pavilion takes you through the Toronto Zoo’s Kesho Park, an accurate representation of Africa’s savannahs, plains and grasslands. It’s here you’ll find the zoo’s herd of African elephants, shaggy and snorting warthogs, wallowing hippos and white rhinos. 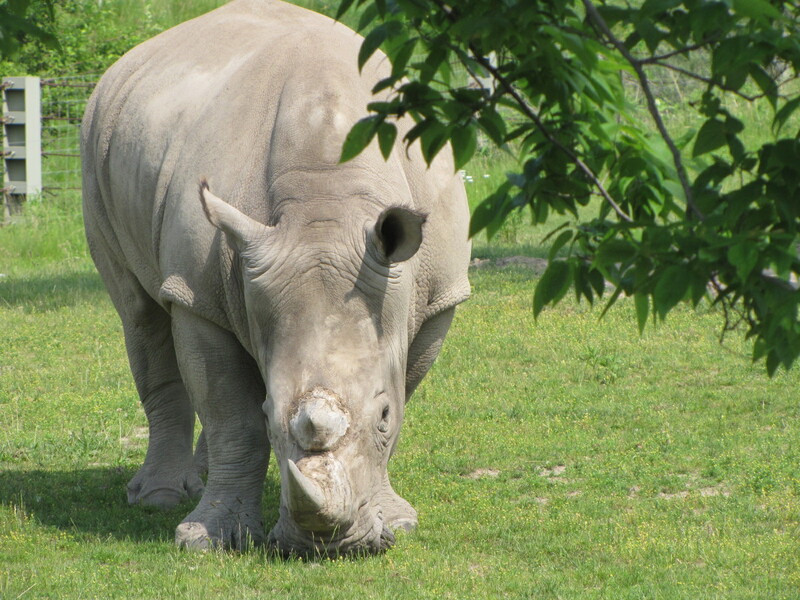 I fondly remember visiting the Toronto Zoo with one of my college classes and we had the opportunity to go behind the scenes to meet with one of the rhino keepers and his charges. To this day, even after working at a zoo, it is still the largest animal I’ve had the chance to get close to. At almost 6′ tall and on average 5000 lbs you would think one would be intimidated and fearful, even with solid iron bars between, of such a massive and strong animal, but I wasn’t. Maybe it was my overpowering love of wildlife or maybe the shock of such an amazing and rare opportunity, but I felt nothing but awe and respect. As the handful of us students stood there face to face with these impressive creatures the keeper gave us the chance of a lifetime – “You can touch them if you’d like,” he said. I was floored! I approached the rhino closest to me and after a pause that felt like an eternity as we stood eye to eye, I reached in and gently rubbed the back of his ear, it felt as smooth and soft as a baby’s bottom. I remember thinking, “We all have a soft spot“.